Our front door is so far away from the driveway. (its kinda ridiculous how far it is) so we almost always go in through the garage. A Push of a button and we are in! When we moved in it was evident that the wall (that I’m about to show you) had something on it like a cabinet or shelf and it was taken with whoever left. So the wall was scuffed up, had some holes, weird marks and looked pretty bad. I had a temporary picture there for awhile but it was still pretty ugly. While I was watching football yesterday- my fantasy team was down (losing) and I decided to get up and be productive. 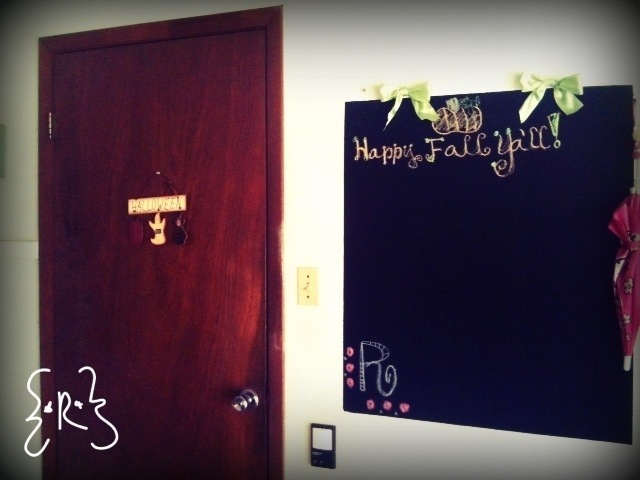 I literally bought a can of chalkboard paint to do something cool and unique and fun for my oldest daughter when she was 2. (In 2007) She is now 7. 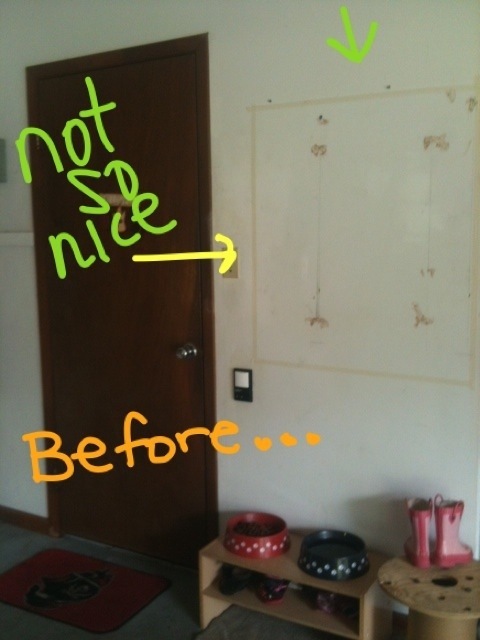 And did 3 coats with a paint brush (drying between each coat) of the Chalkboard Paint (Elmer’s) – I could have done without the waiting part. I peeled off the tape immediately after the 3rd coat because I read on Pinterest that was what was best (and we all know Pinterest is always right). It was pretty simple. The hardest part was waiting to see how it turned out. Once it’s dry, write-away. I figure ill use it for reminders, and to welcome guests when they come over since they’ll be coming in that door. I’m sure my little ladies will enjoy it too. *This paint worked great and is awesome. I will absolutely be chalk boarding many things to come! Worth the money! I want to add some sort of border or paint around it but I haven’t decided what to do yet. So I will wait. But I did grab some ribbon and made a few bows for the top of the board. I love it! !